To visit Madrid is to tour the Prado Museum, the Royal Palace or the Real Madrid Soccer Stadium. The cocido madrileno is the most popular speciality of Madrid’s gastronomy. There are several beautiful parks to relax in. The centre of Madrid has many attractive tourist places. It is a joy to go shopping. Madrid also offers an exciting offer in flamenco and shows. But, is there anything else to know in Madrid ? Of course, there is. A lot. There are excursions from Madrid for all tastes. To places that are 1 hour from Madrid. Some are popular. Others that almost nobody knows but that are worth. On this blog we propose the 5 best tours around Madrid that you should enjoy. Are you a traveller who wants to get away from common tourist places ? If yes, don’t stay where ‘everybody’ goes and continue reading. 2 2.- EXCURSIONS FROM MADRID TO THE LAKES AND FORESTS OF THE SIERRA NORTE. ROME founded the fortress of Toledo on a large rock bordered by a long river. Toledo Fortress became the centre of Hispania. for the military and merchants. Its geographical location allowed the Romans to distribute metals, salt and agricultural products. The best way to enjoy Toledo in depth is through a private tour in a luxury Van. Great Advantages : Free time planning. Enjoyment of tourist sites that the traveller would never know by himself. The journey between Madrid and Toledo takes 45′. A private tour of Toledo allows you to understand its history. To discover ancient streets, monuments, art and landscapes. Toledo’s Cathedral has an indisputable religious and artistic value. It boasts hedonistic, kabbalistic and apocalyptic symbols that travellers should not overlook. All symbolism integrated into the Toledo Cathedral enlighten Spanish history. From the 13th to 17th century. The Burial of the Count of Orgaz of El Greco is more than a masterpiece of universal painting. This painting deserves a detailed exposition. Of its characters, its adventurous symbology and exemplary pictorial techniques. It is exhibited in the Church of Santo Tome. Its bell tower with horseshoe arches recalls the Muslim past of Toledo. The most astounding Toledo Cave is a proof of the religious dichotomy of the New Christians. (Jews apparently converted to Christianity). Jewish Toledo is a sealed labyrinth of caves. Jew converts practiced underneath their original religion. An authentic Toledo cave is a rare archaeological treasure. You can only visit it on a private tour. Forbidden to Tours Operators. This cave is an unavoidable part of the best tours around Madrid that you should do. Communicating with notable citizens of Toledo is a way to enrich travellers experiences. Tour Operators clients only communicate with their guide or with souvenir shop vendors. It is better to have a relaxed conversation with inhabitants of Toledo. Without involvement of commercial interests. This is a good way that a traveller has to assimilate the idiosyncrasy of his interlocutor. And only a private tour from Madrid to Toledo facilitates this privileged communication. 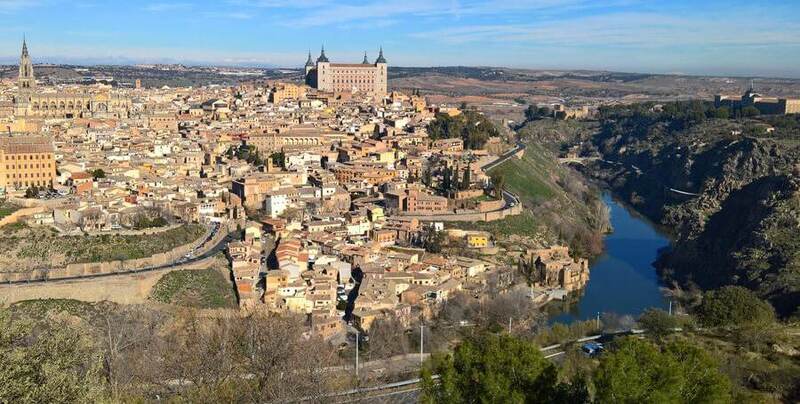 Combine the Prado Museum and Toledo in 1 day. There is only one private tour about the Prado Museum and its Jewish secrets. Furthermore, there is a private tour that allows you to combine any of our 10 tours of the Prado with Toledo. In 1 day. 9 unforgettable hours to enjoy, like nobody else, 2 most demanded tourist attractions. They belong, of course, to the best tours around Madrid that you should do. 2.- EXCURSIONS FROM MADRID TO THE LAKES AND FORESTS OF THE SIERRA NORTE. The Sierra Norte of Madrid is 45′ away from the capital. We will arrive there via the A-1. It has 42 municipalities inhabited by a population of only 29,345 inhabitants. Nature reigns in the Sierra Norte of Madrid. Charming little villages scatter in an idyllic rural setting. There are here dense forests and beautiful reservoirs that supply water to Madrid. Stone houses and churches stand out in every village. Everywhere you can smell the aroma of wood-burning ovens. It is still possible to see how some locals keep their cows in the courtyard of their houses. There is no doubt that the Sierra Norte preserves its cultural heritage. The excessive urban development hardly contaminated it. That’s why the Sierra Norte had the nickname Sierra Pobre de Madrid. Because its beautiful landscapes are a jewel for rural tourism. There is only 1 private hiking tour of the most untouched sites in Madrid’s Sierra Pobre. From Madrid to the starting point of the Sierra Norte hiking route you go in luxury Van. Driven by an expert guide in sustainable tourism. He knows the Sierra Norte like the back of his hand. During the journey, many stops to take pictures. And to enjoy the diversity of the rural landscape. Another stop in a beautiful village of stone houses where the traveller will taste typical regional tapas. Begin of a pleasant hiking route of 2,5 miles. It runs through natural places where exists an optimal preservation of nature. Through a gentle slope of 164 yards. Pine forests and extensive green valleys where the cows graze dominate the landscape. The hiker will be able to tell many things after his walk. For example, that he saw stone houses as beautiful as in Saint Cenery le Gerei. Coniferous forests as in the Ardennes, large lakes for water sports as the Grosse Plöner See. Everything in a rural setting which is only 45′ from the centre of Madrid! Have you already seen all the tourist sites in Madrid that interest you? Are you a traveller who likes to combine ancient history with hiking through a pristine nature? Madrid Norte has an ideal tourist offer for early-warmer hikers who want to get away from well-worn tourist itineraries. If you belong to such a category of traveller, you will be interested in reading on. You won’t want to miss one of the best tours around Madrid that you should do. There is a Private Tour which includes a personalized visit to a medieval castle. This, combined with a 5,6 miles hiking trail. You climb 310 yards through a mountainous terrain of lush vegetation. The difficulty of climbing is minimal for any hiker. From the top of the mountain the hiker will enjoy one of the most beautiful panoramic views of Madrid. Manzanares del Real is the name of the Medieval Castle. Finished in 1435 and named protected monument in 1931. Its excellent conservation shows the beauty of the palatial architecture of the Renaissance. A walk through the rooms of the castle will allow the traveller to learn the habits and ways of life of the Spanish nobility. In particular, of the noble Mendoza family, one of the most powerful of Spanish history. At the same time, you can transport yourself to the 14th century. All you have to do is to admire the landscape through the windows of the castle. On the way down the mountain, and before visiting the castle of Manzanares del Real, you will have a delicious lunch in a typical bar. The traveller will taste succulent gastronomic specialties from the Sierra Norte. All hikers who know this area agree that it is one of the most beautiful tourist sites in Madrid. The duration of this private tour is 8 hours. The journey, in luxury Van, from the traveller’s hotel to Manzanares del Real is 35′. There are many tapas tours in the old part of Madrid. Most of them run through similar taverns. No doubt that many of these taverns are full of tourists. Local clientele is scarce. One of the most popular tourist spots in Madrid is the Royal Palace. Endless groups of tourists roam its halls. Yet, dormitories and social rooms of the kings remain closed for them. Faced with this, many travellers ask themselves the same question. Something where you can feel a local ambiance? Perhaps places that are not excessively touristy? Where you can have a vermouth with soda and listen to all the clientele speak Spanish? We are going to propose you another of the 5 best tours around Madrid that you should do. Royal Palace of Aranjuez . Delicious autochthonous gastronomy. Excellent wines from local wineries. Awesome Impressionist Museum. Unpolluted Rural Landscapes. Charming little villages and bell towers. A private tour to the capital of rural Madrid. A luxury Van trip of only 45′ from your hotel in Madrid. South of Madrid, an incredible town. Full of favourite bars and restaurants of the people of Madrid. On weekends, Chinchon looks packed of visitors from Madrid capital. Madrileños who come to enjoy the famous gastronomy of Chinchon. Appetizing tapas, food portions and dishes. Cooked with products from the fertile agriculture of the south. And tasting strong wines fermented in family wineries in the area. The private tour includes the Royal Palace of Aranjuez. A royal site where the Bourbon Kings of Spain had spring holidays. At last, you will be able to see here things that are not exhibited in the Royal Palace of Madrid. For example, stop at a spectacular queen’s bedroom. Delight your senses in an amazing Chinese Porcelain Room. Or admire charming rooms of royal gatherings. The huge Prince’s Garden is a creation of King Charles IV. The private tour includes a pleasant walk through the Prince’s Garden. It has a romantic style. The painter Santiago Rusiñol specialized in beautiful paintings of the Prince’s Garden. Lovely in all seasons of the year. We will visit the Casita del Labrador. It is a flirtatious palace built and dedicated to love. We will reveal its most spicy anecdotes. Aranjuez is the main village of Madrid’s Low Meadow ( Vega Baja ) region. Its varied agricultural production gets extra quality qualification ; the Best. Aranjuez is a city full of history. This is where King Carlos III came to comfort himself. Of the ingratitude of the people of Madrid. There is no reason to panic. It happened 254 years ago. Also in Aranjuez, an enraged populace wanted to stab a Prime Minister. A Barbarian event : The Mutiny of Aranjuez. It happened long time ago; 210 years. Every year, Aranjuez reproduces the Mutiny of Aranjuez. A popular rebellion, transformed into a theatrical representation. But there are many other stories. That you will hear during a pleasant walk through the Garden of the Island. Another emblematic garden created by the 2 first Habsburg Kings : Charles I and his son Philip II. The Ulpiano Checa Museum stands out in another charming village: Colmenar de Oreja. In this museum you will learn the history of a humble child who became one of the best Spanish painters. He lived between the 19th and 20th centuries. His magnificent work show the main civilizations that populated Spain. His paintings inspired many famous Hollywood films. Ulpiano Checa achieved international fame. He enjoyed a privileged economic situation. Ulpiano never abjured from his humble origins. He often visited Colmenar de Oreja to meet his lifelong friends. In Colmenar de Oreja there are also family wineries that ferment wine ‘for the love of art’. Its production is too small ( to make money ). Although, of estimable quality. We will take you on a visit to a winery. You will taste your wines and judge its quality. Do you think that with this tour you will feel a local and genuine atmosphere? The answer can be no other. You already have another of the best tours around Madrid that you should do. This tour is what many travellers dream about. Discover a tour that no tourist has ever heard about. It is not published in any tourist guide. Not even in Tour Operators programs. Not even in our offer of 43 private tours. But it’s time to unveil one of our secret tours. Only to the reader of this blog. The private Tour to the unknown mountains of the west. To the southern part of the Sierra de Guadarrama. Departure in Luxury Van from your hotel in downtown Madrid. We head towards the northwest of Madrid. The winding rural road is pleasant. On both sides, stone walls fence private hunting land. On both sides of the route, forests of cork trees. You will see many cattle of Iberian black cows from Avila region graze in them. Stop 1 : The Royal Monastery of San Lorenzo del Escorial . It could be the eighth wonder of the world. Visit of 1 hour in a personalized tour. Erected by King Philip II. It is an impressive Renaissance building that reflects in its architecture the complex personality of the king. Royal palace, royal pantheon, basilica, library, convent and school. At the end, you will be an expert in Philip II and his epoch. The tour continues. It goes uphill along a winding road. We pass the port of the Green Cross. Through the panoramic roof of the Van, you can see the flight of autochthonous birds. Stop 2 : Las Herreras. It is a lovely stone hamlet. There are few inhabitants left. Time to stretch legs. Stone houses, absence of crowds, the beautiful mountains invite to walk. After about 15′ we arrive at the old Civil War bunkers of las Herreras. It is the right place to talk about the Spanish Civil War. And to dismantle its many myths and manipulations. Stop 3 : Santa María de la Alameda. It is the last municipality of the Sierra Oeste of Madrid. On the border of the province of Avila. The houses are of a beautiful stone architecture. Pine groves surround the village . From la Peña del Aguila you will enjoy beautiful views of the Sierra, Valley and surrounding villages. Stop at a typical inn to taste a succulent menu. Based on local specialities. Stop 4. Peguerinos. Lunch has been very rich. People of this Sierra like to eat. It proceeds to burn calories. The Van leads us to Peguerinos. We are now in the province of Avila. We get out of the vehicle. It begins a route of hiking through a mountain that seems enchanted. Unforgettable beauty. Hike through a leafy forest route dotted with streams. Spectacular panoramic views. To the Acena Reservoir and the middle of the Sierra de Guadarrama. Scattered along the route are more bunkers built by both confronting sides on the Civil War. Vestiges of a terrible confrontation. Its echoes still resounds between trees and rocks of this enchanted mountain. The reader should know that the duration of this sightseeing is 8 hours. It may be one of the best tours around Madrid that you should do. We encourage you to contact us for more information about price and conditions.